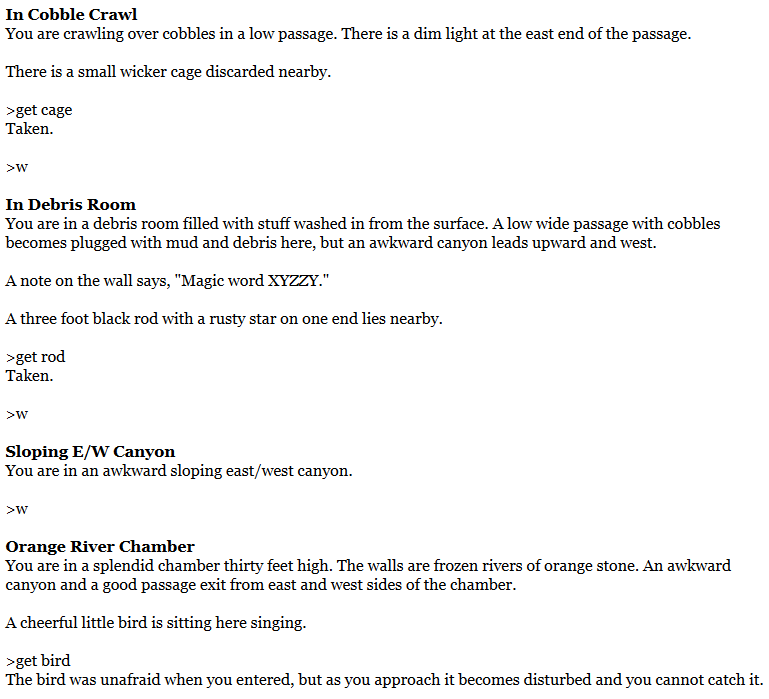 This is the fifth in a series of quick-start Inform 7 tutorials using examples from Colossal Cave Adventure. More information about this tutorial series can be found here: A Quick-Start Guide to Inform 7. As you head into Colossal Cave, you discover a bird singing to itself. The bird is a brave little fowl that can drive off the giant snake you encounter later, but only if you catch it in the cage. However, the bird is frightened by the rod, so you can only catch it when you aren’t carrying the rod. This lesson will cover creating all four of these objects (the bird, the snake, the cage, and the rod) and then cover all alterations to the bird’s behavior to produce the results above. There is a room called In Cobble Crawl. There is a room called Orange River Chamber. Orange River Chamber is west of In Cobble Crawl. There is a room called Hall of the Mountain King. Hall of the Mountain King is west of Orange River Chamber. There is a room called Low N/S Passage. Low N/S Passage is north of Hall of the Mountain King. This is obviously a very bad implementation of Adventure, but it will suffice for these purposes. People are a kind of thing in Inform 7. They inherit all the innate properties of things, but they have additional properties that are specific to people. The bird and the snake are animals. You can create them just like creating a thing, but you must specify that they are animals. Before continuing, let’s create the rod and the cage. I’m putting the rod in In Cobble Crawl for convenience. There’s something interesting about the rod, which is that its description is longer than just a few words. Even in your inventory, the rod is “a black rod with a rusty star on the end”. Not only is this a pain to type repeatedly, but it confuses the system badly enough that it won’t compile. A black rod is in In Cobble Crawl. The printed name of the black rod is “black rod with a rusty star on the end”. …and here’s the result, examined with the debug command SHOWME. Understand “rusty/star” as the black rod. Creating the cage was also covered in Lesson 2, so I’ll pick up the source from there and move on. As shown above, Inform won’t normally allow you to get a person (or in this case, an animal.) Let’s change that. 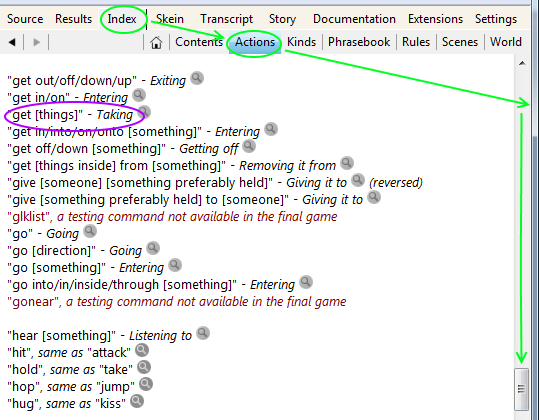 The first thing we need to do is look up what action we are using, through Index -> Actions and then checking the alphabetical list. This is important because Inform implements many synonyms for the same command. The command for getting something is actually taking. 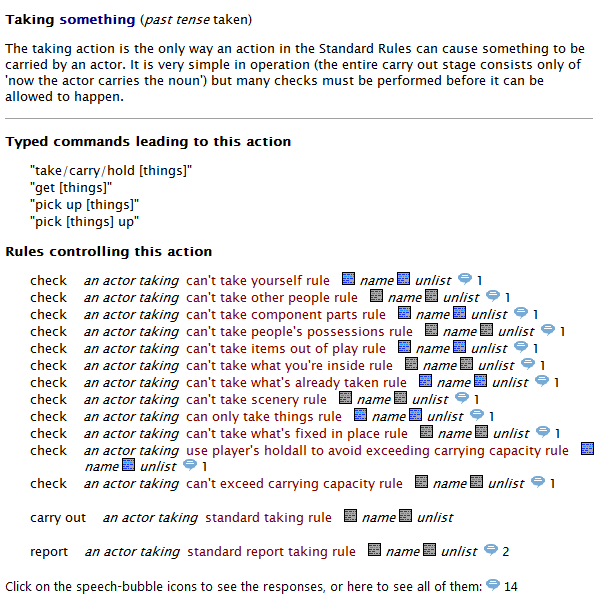 report rules (messaging the player about the execution of the action). Clicking on the magnifying glass beside taking provides a detailed look at the structure of the taking verb, broken into those three parts. Reading this list, it’s clear that we’re being blocked by the can’t take other people rule. But what if that wasn’t obvious? The debug command RULES will show a list of all rules being executed in a turn. If we want to interfere with an existing action, there are three ways to do that. The three ways to interfere with existing actions are before rules, instead of rules, and after rules. Before rules precede the check rules. Instead of rules come after the check rules, but before the carry out rules. After rules come after the carry out rules and replace the report rules. In this case, we need to intervene before the can’t take other people rule can shut down the action. This is a before rule. Now is a word that changes the game state. This was covered briefly in Lesson 4, where we looked at the syntax “now the player is in…” to move the player to another room. The logic system if and else was also covered in Lesson 4, when we looked at teleporting the player from place to place. Stop the action does exactly what it sounds like: shuts down all action processing from that point forward. Since all routes through “take bird” end in “stop the action”, this has effectively turned off all the check, carry out, and report verbs whenever taking the bird. There’s one clause missing, however. What if the player is already carrying the bird? Normally, the can’t take what’s already taken rule would intervene, but our new before rule precedes all check rules. 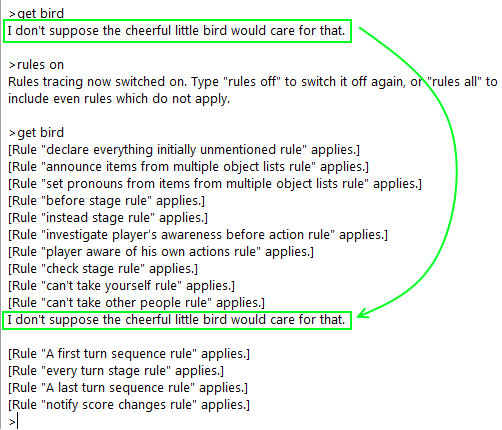 Observe the specific syntax used: “if the player encloses”, rather than “if the player is carrying”. 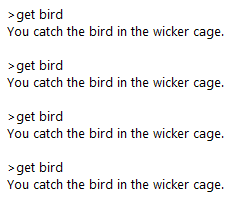 If the player is carrying the wicker cage, and the bird is inside the wicker cage, then the player is not carrying the bird. Checking for enclosure will check through all layers instead of just the immediate inventory layer. The player cannot pass the snake in the Hall of the Mountain King without frightening it away first. We can use another before rule to stop the player from moving past. Note that this rule is triggered whenever the player goes north, no matter where the player is. 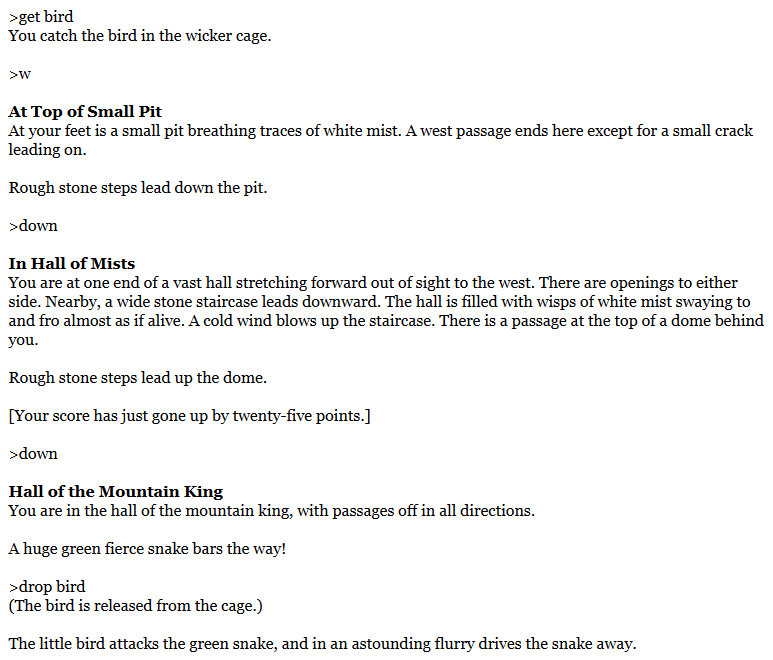 However, if the player is not in Hall of the Mountain King with the snake, then the rule will have no effect and the normal check, carry out, and report rules will follow. This behavior pattern works with before rules, but it does not work with instead of rules or after rules. Instead of rules and after rules replace everything following them – “do this instead of this” – unless there is an explicit continue the action that follows. In our rule above, we only have one blocked exit implemented – north. In the real Adventure, however, all directions are blocked except for the way we came (up, in the original; east, here). To recreate this, the before rule should cover going globally, and then check the direction to see whether or not the player is retreating. Normally, the player needs to be holding something in order to drop it, due to the check rule can’t drop what’s not held. To avoid this rule, you can again use a before rule to avoid the normal check rules. Remove the snake from play is exactly what it sounds like – the location of the snake is now “nowhere” and the snake appears in no room. This is supposed to be a quick-start guide, but this lesson has done even less justice than most to Inform 7’s extremely deep systems. Reading all of chapter 7 is highly recommended for a better understanding of the before/instead/after rules and Inform’s associated toolset. Also, see Example 19 (“Laura”) for more about printed names. I have some free time lately, so I’ve been working through Inform tutorials. Having been out of the loop for a while, I was surpised to see that some of the old materials from just a few years ago were no longer up to date, including Aaron A. Reed’s book. I’m happy to find this tutorial! It’s very frustrating to work with the room names with leading prepositions. I often inadvertently leave them off when typing in the source code, typing “End of Road” or “Cobble Crawl,” which creates Problems. This has been a lesson to avoid using prepositions at the start of room names. Too confusing for Inform. So glad you’re finding this useful! I’m so glad I finally found some tutorials I can actually understand!! These lessons are perfect for an absolute beginner like myself. I did have a question about this particular lesson, though. After having completed all the source text and testing it out, I’ve found that once I drop drop the bird to remove the snake, the bird is still in my inventory. Am I doing something wrong? So glad these are helping! Just confirming: is “now the bird is in the location of the player” in the same place in your source as shown here?